just pulled my 11T's out of storage and am trying to get them up to snuff. i have been out of the audio loop for a good many years, and am trying to learn. question... has anyone used this upgrade kit from Ebay, or woul;d i do better elsewhere? and if eleswhere, can somebody point me in the right direction. i do have to be somewhat budget minded. Welcome to Club Polk, Steve. You can upgrade your crossovers in a more effective manner than that. HERE is the schematic for the RTA11T; if you have modest soldering talent you can do a part-for-part swap of the capacitors and resistors and be pretty satisfied. If your budget is truly tight, you could order Dayton capacitors for the 12uF and 34uF values, and Mills 12-watt wirewound resistors for the 2.7 ohm and 1.5 ohm values and escape pretty lightly. If you can swing it, I'd recommend calling Polk and ordering a pair of replacement tweeters (RD0-194) to replace the SL2000 tweeters found in the RTA11T. About $48 apiece shipped (mention you're a Club Polk member!) and they give a smoother, more pleasing treble. If you can expand your budget a bit more, you can order Sonicaps (Gen I) from Soniccraft.com for the 12uF capacitors in the tweeter circuit. They're having a 20% off sale right now so the time couldn't be better. In any case, you have a nice pair of speakers that (IMO) are well worth upgrading. If you can do the whole works (crossovers and tweeters) you'll have something you can probably be satisfied with for as long as you wish. One last tip, since Polk occasionally used up their remaining stock of nameplates when putting out a new line of speakers, it's worth double-checking that you do in fact have 11Ts and not 11TLs. 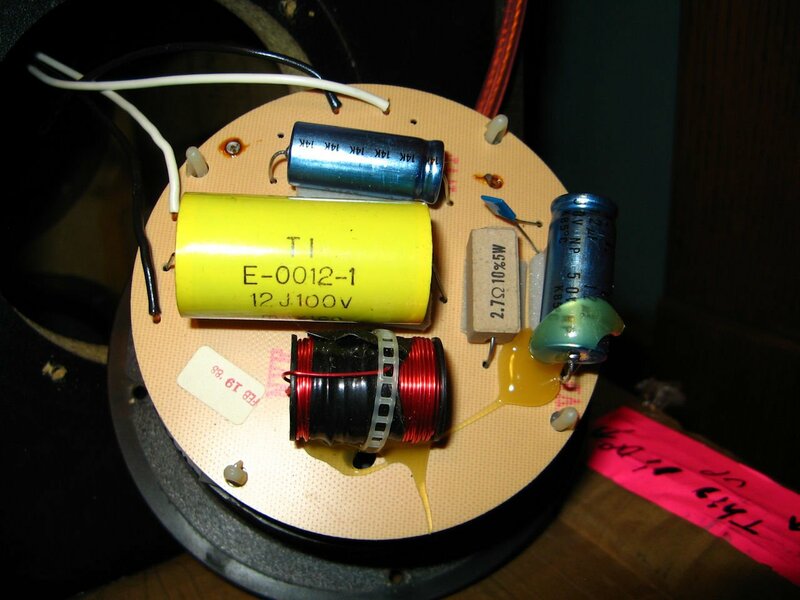 The 11T has the SL2000 tweeter as shown in the pictures here, with the visible leads going off to each side of a silver dome. Hope your project goes well, and there's lots of folks here that have done what you're setting out to do, so advice is easy to come by! Very good suggestions ^^^^above. Don't waste your time with that Ebay kit it's no better than you have in the crossover now. Looks like my PartsExpress link shows they don't carry the 2.7 ohm Mills. Soniccraft does. thanks for the good info folks. this is a super great place! i will check out the links when i get home from my long day... i do have a budget, but i also want to have as good a sound as possible given my components. this is going to be my computer audio set-up.i have a NAD C 325BEE hooked into the computer via a Matrix Mini DAC. i got the polks way back in the day out of a pawn shop, but haven't had anything set up for a long time, so i am quite excited to have this project... i have been living on computer speakers for far too long. and yes agfrost, they are 11Ts with the SL2000s. do most people leave the tweeter protection or remove it when upgrading? If you're judicious with the volume control, it's believed to be an upgrade to just solder a jumper in place of the polyswitch (tweeter protection). The crossover I updated (RTA11TL) didn't have a polyswitch, so I cannot say, but there are some who prefer to put a small resistor (~0.5 ohm) in place of the polyswitch; others prefer to just put a wire jumper. I'm not sure if I saw the auction that you're referencing, but I did see a "RTA11T crossover" auction recently that I wasn't sure if it was actually from an 11T--didn't look like the others I've seen. Did it look like the one from post #5 here? Most of us remove the polyswitch and use a .5ohm resistor in it's place. Here is another decent cap for your budget. http://www.madisoundspeakerstore.com/px-cap-250vdc/ If your leaning towards the Dayton caps these are a little better and about the same price. well, i guess i have shown both my noob-ness and my over-anxiousness. the item shown in the auction looks very close to your link, and nothing like the crossover i just pulled from my speaker....stupid me. edit: upon closer inspection, it really doesn't look like either lay-out wise, but the electronics are more 11TL like. here's the pic from the auction. if it is in fact 11TL, can i still make use of it? any old .5ohm? i would assume this has no sonic impact? and looking at the schematic... do you not differentiate between the electrolytic and mylar caps? just order all the same? so it looks like this. (2) 33 uF Daytons...for the 34 uFs. couple of .5 ohm resistors if i so desire. anything i might be missing? Sonic Craft also carries AXON(?) caps, which are comparable to Dayton. Picking up everything at the same place will help you save on shipping. and i would love that, but the only 33 uF i can find on the site is a Sonicap, which is nearly $48... which i one new RDO194. i need to save somewhere..
i can get $7 shipping. could be worse. You have to call or email them and ask for that cap, it's not on their site. ok then! thanks for everything. gonna get it all ordered tomorrow. Steve, I've got a pair of 33uF Jantzens that are yours for the asking. Make a couple more posts then send me your address in a private message (click my username) and I'll send 'em out your way. i remember the question i had last night.... the resistors in my Xover are 5 W.... since i do not fully understand each part's function, what does changing to a 12 W resistor do? its far a whole different use. ok... so not these? they are the only .5 ohm with a 12W value i can find. Welcome to the club. I highly recommend you go with the Sonic Craft Sonic Cap. It is much better than the Axon caps. If you have a value you cannot find on Sonic Crafts website, contact them and they will steer you in the right direction. If you can go for 12W Mills resisitors (as others suggested) in the values you are looking for, go for it. Then after, you will want to add Dynamat Extreme to the speaker baskets to prevent ringing, and add mortite to seal your speakers. It will be a completely different speaker after performing all these upgrades. Statistics show that 98% of us will die at some point in our lifetime. The other 2% will work for WalMart. i am mostly going that route...for now. all i need to know is if these (http://www.parts-express.com/pe/psho...tnumber=005-.5 ) are the correct resistors to replace the polyswitch, and i am good to order. of course, then the speakers will be so good, they will make me annoyed with my NAD, so i will have to shop for a new amp... then round we go! yes those are the ones you should be able to get them through Sonicraft if that is the direction you choose. Welcome to the fold officially now, Steve. You came inquiring about a $20 ebay kit and now look at what we've "helped" you to commit to! Not sure what NAD you're running, but most of what they make won't necessarily be outclassed by your 11Ts (I'm feeding my modded 11TLs with a NAD 2600A amp to good effect). Of course, there may be gains to be found...:twisted: I think you'll be pretty happy with what you're planning. all the caps, resistors, and 48 feet of solder ordered form soniccraft today... just a touch over $100 with shipping, so not too bad. 20% off is a great thing, plus they are real nice on the phone. good service and very helpful with my questions and insecurity. the NAD is a C 325BEE 50 watt integrated, 2006-2008 era. i also have a 2150 and so wish i could run both... but the integrated doesn't bridge. i like the NAD gear, but i am well aware of its limitations and colorings. it will suffice for now as budget will limit experimenting with truly high end amps, and my wife will limit the necessity for more power. packages are rolling in... one more to go tomorrow before i can start. i received these ebay Xovers today, and the more i look at schematics, i am fairly certain they are 11T and not 11TL. the resistors are 2.7 and 2.0, which is not TL. any thoughts please? i would like to use these if i am correct. That would appear to be a match for the 11T schematic: 12uF electrolytic, 34uF electrolytic, 12uF mylar caps; 2.0 and 2.7 ohm resistors, polyswitch. 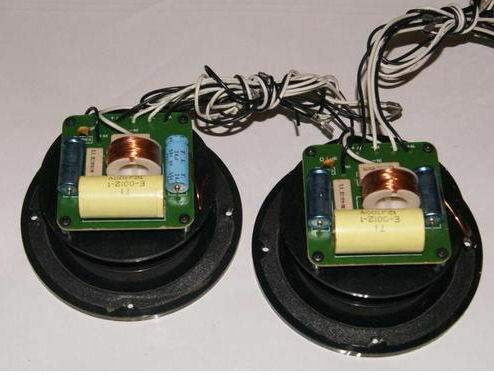 Have you pulled the crossover out of your speakers to see if they're exact matches? 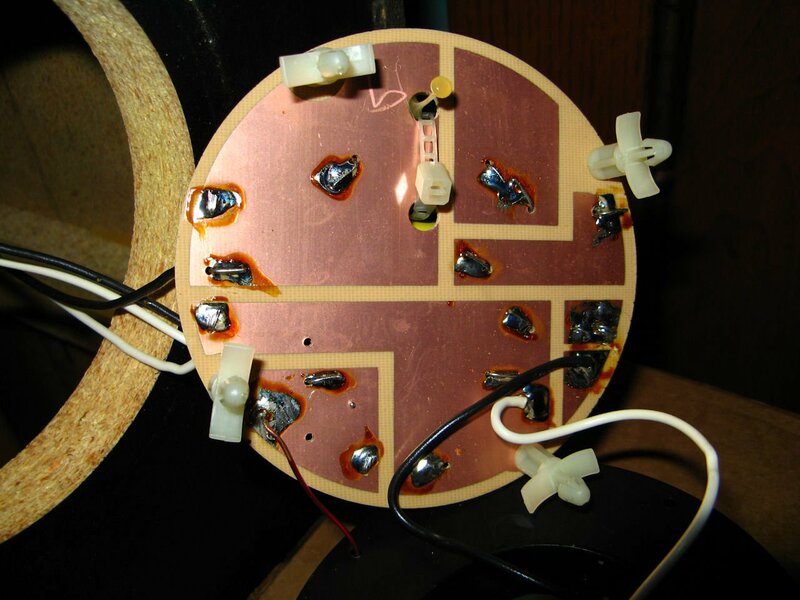 If you unscrew the board from the "cup" you can follow the copper traces to see if everything is tied together as shown on that schematic (just to be sure and to familiarize yourself with the circuit). Oh, and one "I'm sorry to give such obvious advice" bit of advice, but do your crossovers one at a time, so you've got a comparison. here is a pic of current crossovers, front and back... so these large copper sections are the traces? i am used to looking at motherboards and such, much finer paths. looks like a match component-wise though the inductors don't match. Yep, those are the traces. Crossovers are a heck of a lot easier to solder than a motherboard, eh? Definitely doesn't require the same level of precision. This crossover looks like the one in the TLs that I worked on--Honestly I wasn't convince that the crossovers you got on ebay were 11T's until you posted the larger pics so the components could clearly be seen. They must have been from an earlier production run? 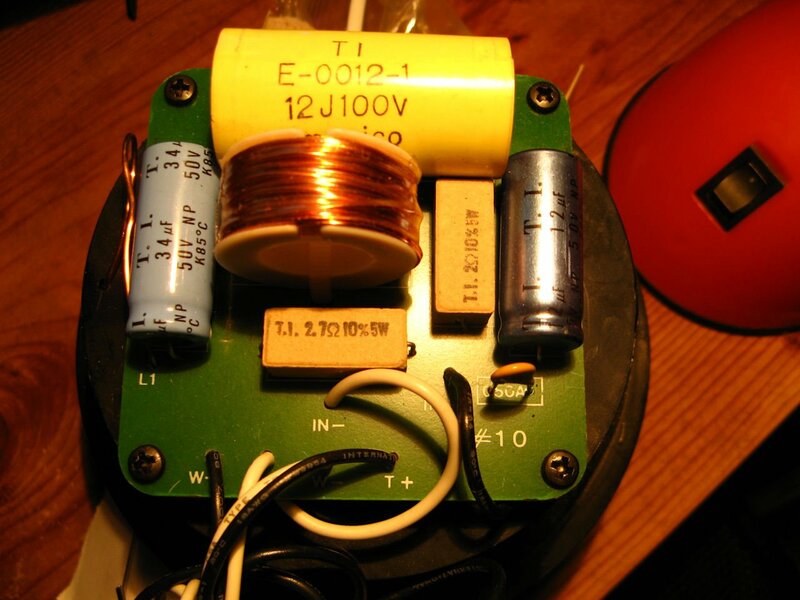 I'm guessing the inductors are an electrical match if not a part-for-part match. Simply because I worked on crossovers that looked like the ones in post 27, I'm more comfortable imagining working on those (but I'm not doing the work so you can decide if you have a preference!). Perhaps you can check the location of the through-holes on each style crossover and determine if one will be easier to lay out your new and larger caps on. If one looks easier/simpler, that's the one to go to work on. this will be a fun weekend. there is just not enough time in my week to dedicate focus. i want to make sure i do this right. new question, same 11T's... i bought some spikes, and since the 11T has a foot on it, i assume you put the spikes in the "floor" of the speaker and not in that rim around the bottom? I'm trying to remember how the base of the 11T is constructed--My 11TLs don't have that 'rim'/frame you mention. Are the slider feet mounted on that part of the base, or on the part that is the actual main cabinet? You'll want the feet to go into the more structurally sound "floor" like you're imagining above.